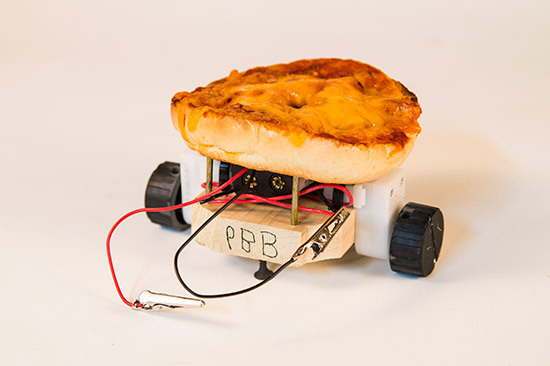 Our old (dumb) pal Pizza Bagel Bot didn’t spring from the oven fully baked… far from it! Why, I’ll have you know I spent nearly an hour carefully crafting a block of wood and a delicious meal into a whirling cheesy disaster! 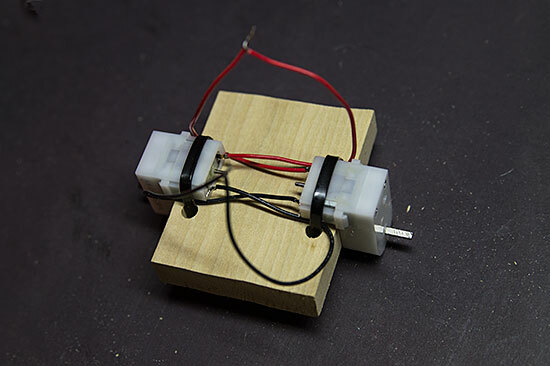 I started with a nice block of wood and drilled a few holes to mount the motors. 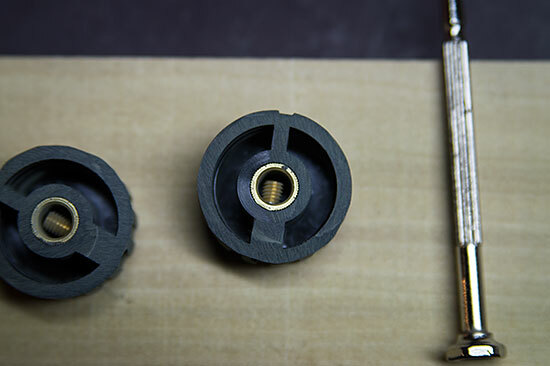 The motors are these Pololu 120:1 Mini Plastic Gearmotors. These were the only “high-tech” thing I used. Just under $12 for two motors. 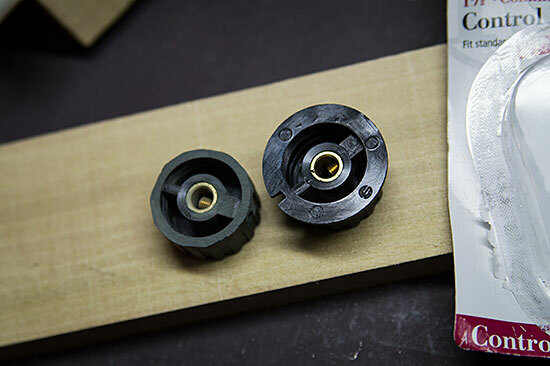 Now, for the wheels… I actually designed laser-cut wheels that fit nicely on these motor shafts, but… high-tech! 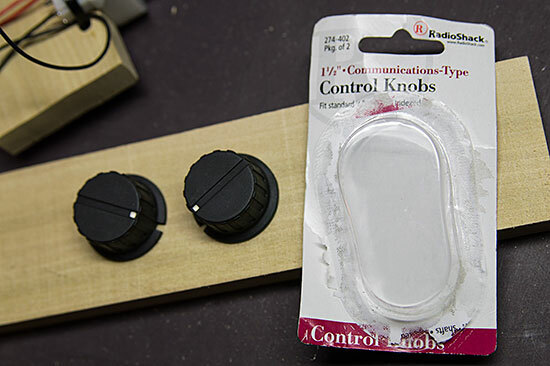 Instead I dug through the basement workshop until I found these old control knobs from Radio Shack. They have a little set screw, and I figured I could screw them tight to the D-shaft. Perfect! Almost! Boom! 5 minutes later, the smell of melty plastic, and I had two “wheels” which would be all wobbly because they didn’t center correctly on the D-shaft. No matter. Wheels are on, and the wires are twisted together, but not soldered, in case I want to reverse the wiring or something. It’s starting to look good. 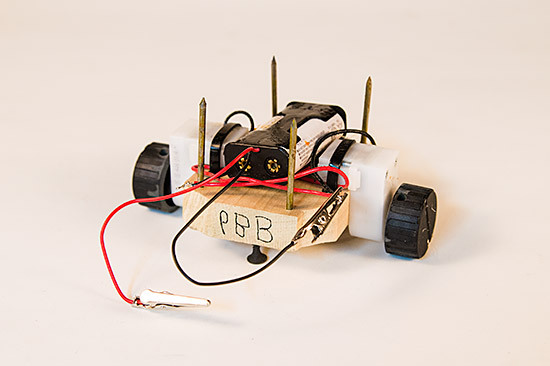 If you squint real hard you might mistake this for an actual not-dumb robot! Nails are good for holding things in place. They also split wood. I split the wood. 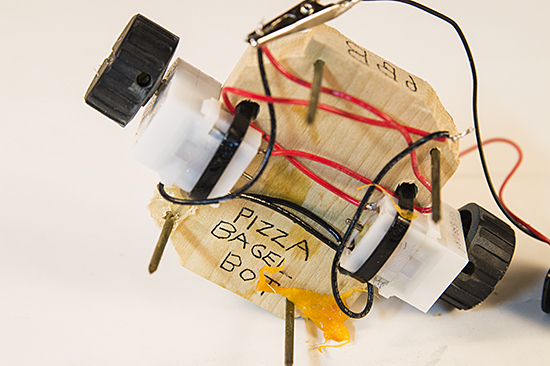 No matter, because… hot glue. I also added this “high-tech” battery holder, which was a whopping 79 cents… Oh, the alligator clips were taken from some jumper wires I melted at some point. It’s not the volts, it’s the amps, kids! The batteries are AA and I’ve had them for years. Oh yeah, the screws! 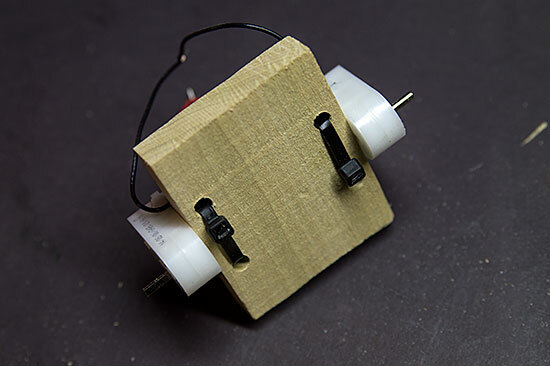 Typically a robot will have a caster wheel or two, but at $1.99 each, and needing two of them… over-budget! (I could have 3D printed one but… high-tech!) The screws are not drilled into the wood the same amount because, me. This helps it wobble more unevenly. On purpose. Obviously. 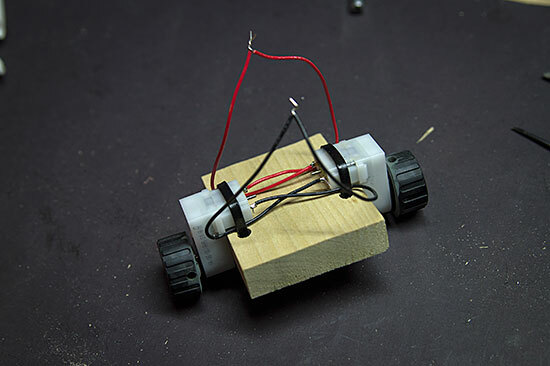 Wow, look at that beautiful robotic platform. In about an hour. And I probably got distracted for part of that hour. The only thing missing is a delicious pizza bagel. Don’t forget to check out the video, which at least one critic described as “mesmerizing”. 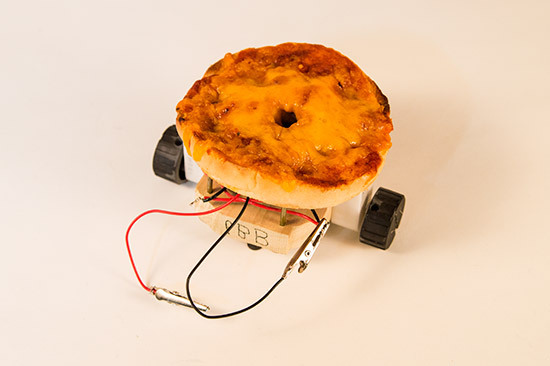 Also, if you’ve got any good pizza bagel recipes, post them in the comments! 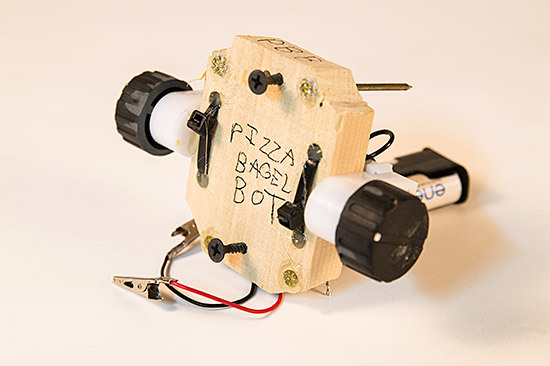 Our friends down at Pumping Station: One in Chicago have taken a cue from Hebocon and are holding a Dumb Robot Competition for Dummies tonight. 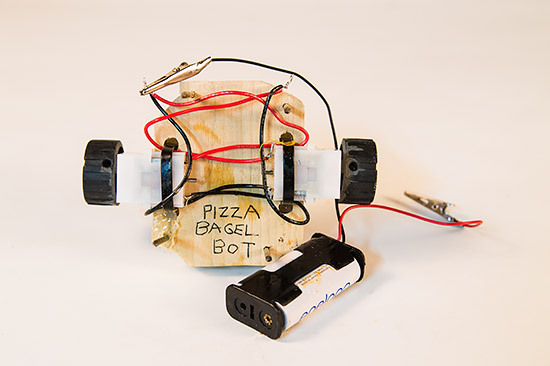 I’m sure this will strike fear into the hearts of all who challenge Pizza Bagel Bot, so beware! And be aware. I’ll provide more details about “PBB” in the coming days, but for now, enjoy this video proof of the mayhem of cheese and sauce that will be unleashed tonight!